Precision Metals and Plastics, LLC is a Service-Disabled Veteran-Owned Business (SDVOB) specializing in the machining of precision parts for the aerospace market. The company's majority shareholder and President is William Bonk, a Decorated Service Disabled Veteran of the Vietnam War. PMP is headquartered in Winsted, Connecticut. 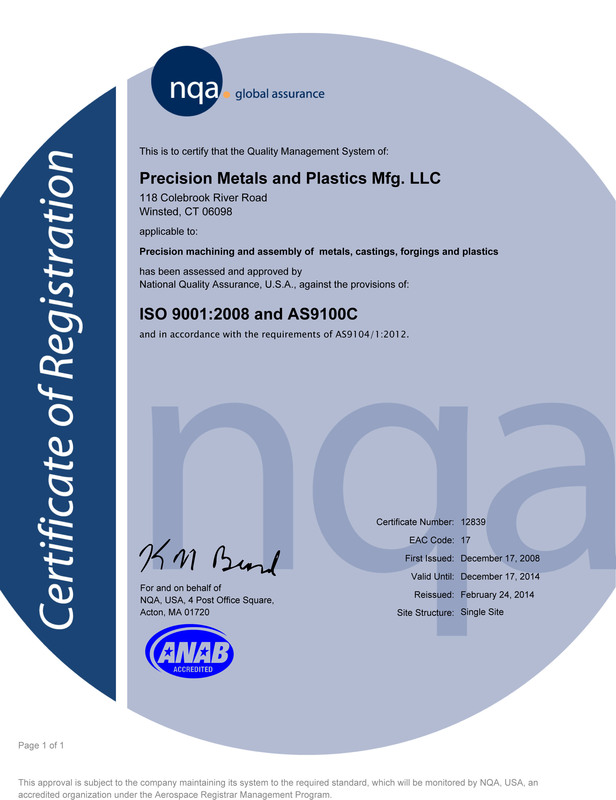 Precision Metals & Plastics is ISO 9001:2008 compliant. PMP is also pleased to report that the company has been AS9100 Certified since December 12, 2008. Bill entered the U.S. Army as a 2nd Lieutenant in 1966. After completing flight school he was assigned to the 7th Squadron, 1st Air Calvary as a Scout Pilot in Vietnam, where he received a Purple Heart and a Bronze Star. Bill later commanded the National Guard helicopter unit at Bradley Field in Connecticut from 1979 to 1980. While serving in the National Guard, Bill began his professional career as a salesperson for Industrial Safety & Supply Company in West Hartford, CT, and assumed the Presidency of the company in 1987.